As you may or not know, I went and lived in Australia in 86-87. Took my student loan and, instead of getting a job at Expo ’86, jetted off to fun and sun Down Under. Remember, this was a time before Crocodile Dundee and Foster’s beer in North America, so why would a Canuck choose to go there? So let’s go back a few more years. When I was in Grade 2-4 in Dartmouth, NS, my best friend was a guy from Oz whose father was going to Dalhousie University. 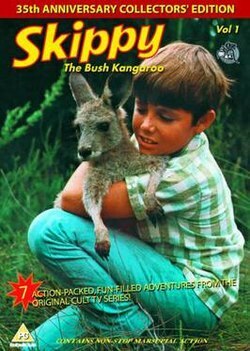 At that point, for me Oz was Skippy the Kangaroo and The Air Doctors – both shows about the rugged jungles and outback. Jump forward to 1983, when my buddy John and I went to see a very weird and strange film, Starstruck, at the local rep theatre in Victoria, BC. This wasn’t your usual Australian film – no world war drama, or disappearing children, or year of living dangerously. This was a new wave, music video pile of crazy. And I loved it. So when I was looking for a country to avoid the ‘real’ world after finishing TV School, I chose Australia, remembering that wild film full of cute girls, fun pubs and awesome music. And I did have a year full of all three. At the time I went, people actually questioned my decision to go to Oz. Too far away, too backward. It was while I was there that I met, and stole a full-time job away from, an Australian musician who would turn out to be my best friend and creative partner for over 30 years, Adam Warnock. I arrived the week Crocodile Dundee opened. It was still playing when I left a year later. I returned to find North America Oz crazy. I loved my time Down Under and have written numerous screenplays set there, trying to capture the craziness of that place. If I didn’t live in Canada, I’d live there. Which brings me around to the screenplay Adam and I have been working on for the past couple years. Our fifth screenplay, four of which are set in Australia. On a creative whim about a month ago, I decided to try something different. The screenplay had come out of a short film we had made, Bangamahamup, so the main characters were essentially us but 20 years younger. What I tried was flipping the genders of the two main characters and the love interest. Wow, I couldn’t believe what a difference that made! Suddenly, we had a compelling and awesome female lead character with a frustrating yet appealing sidekick, and a love interest who was a bit less macho and a lot more interesting as well. How amazing! You never know what will spark inspiration, this was how we changed up a good script into a great one.